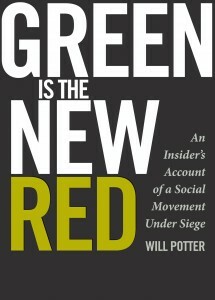 Here are some selections from Will Potter’s book, Green is the New Red, that chart the genealogy of eco-terrorist rhetoric. Regardless of where you stand with regard to environmentalism or monkey-wrenching, it’s nevertheless important to understand how the term terror is being specifically deployed in an age increasingly defined by such a label. The mainstreaming of animal and environmental concerns, combined with tiers of lawful and unlawful groups, was undeniably a threat to the corporations [they] targeted. [Corporations] needed to displace activists from their moral high ground. A key development in orchestrating this fall from grace was the decision to wield the power of language. Government official slowly incorporated the term into their lexicon and change how they spoke of sabotage [toward the end of the ’80s]. After a 1987 arson at the University of California at Davis, the FBI labeled an animal rights crime “domestic terrorism” for the first time. The next year, Senator James McClure introduced the term eco-terrorist into the Congressional record (oddly enough, by comparing the tactics of drug lords to those of environmentalists). Despite these linguistic victories, eco-terrorism was not a top governmental priority. 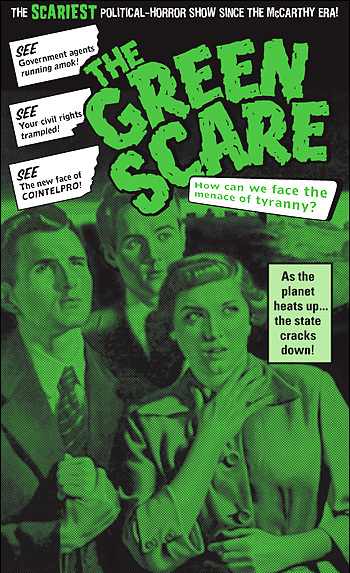 Ron Arnold’s organization [the Center for the Defense of Free Enterprise] and the anti-environmental “Wise Use” movement operated on the fringes; the eco-terror meme remained loosely confined to this niche of free-market true believers, and sympathetic media portrayals continued through the late eighties […] This began to change when politicians got involved in the issue. Examining top-tier newspaper articles from 1984 through 2006, [Travis Wagner, professor of environmental science and policy at the University of Southern Maine] found that terrorism rhetoric appeared throughout the timeline, but its frequency increased dramatically after September 11th and has continued climbing since then. Wagner notes that this increase in ecotage-related stories accompanied a decline in actual crimes. According to the North American [Animal Liberation Front] Press Office–not one to downplay ALF and ELF attacks–crimes decreased by 47 percent after 9/11. As warning of eco-terrorism made headlines, the threat itself waned.